1bidder has no other items for sale. 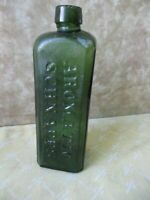 Antique Dark Olive Green Pontil Glass Wine Wiskey Bottle - 12"
TUMBLED - 1800'S ANTIQUE JOHN GILLON WHISKEY BOTTLE!! VERY CRUDE!